The finest window treatments have that rare ability to make a statement that is “uniquely you”. When you buy our window drapes Houston Blinds for Less Design consultants will help you Envision, Create, Transform and Embrace your personal style and, in-turn, achieve truly stunning effects. It all starts with elegant fabrics and attention to detail…. Your options for fabric window treatments at Houston Blinds For Less include drapes, fabric shades, decorative toss pillows, and fabric window top treatments. Fabric window treatments, such as the quality window drapes Houston Blinds For Less offer, make a style that is both sophisticated and uniquely personal. To enhance any home décor, from classic to bold, the soft and high quality fabric adds refinement and warmth to any room, whether formal or casual. Our Drapery will show the enhanced elegance with double turned hems, inspired mitered corners, and detailed sewn-in liners. To complete this elegant collections look we provide bottom weights that ensure nothing will detract from the beauty of your Window Drapes. Houston Blinds For Less also offers various collections of designer drapery hardware for you to select from. Making a lasting impression or statement in your room or office space doesn’t mean you have to settle for a style of aesthetic. Transform your plain room into a spectacular decorated space with our inspiring array of fabrics that enhances to your own look, from contemporary to traditional. Offering additional benefits in privacy, closed window drapes block the public’s view from outside. Draperies also help protect your room and its contents from harmful UV rays and while shielding you from the sun’s uncomfortable glare. As you decorate, consider bringing out your creativity by combining two colors of a fabric for a uniquely custom color blocking look. The second color can be used for the bottom part of the Drape. 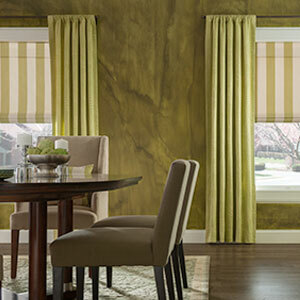 You can also automate your window treatments with motorized draperies. 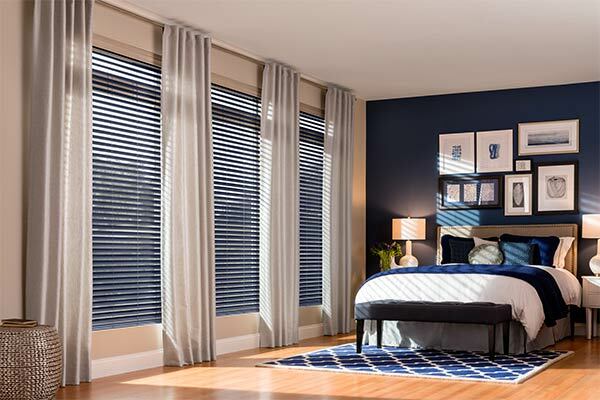 Even if you are looking for more enjoyment from multiple shades of colors on the same Drapes in one room or you prefer a simple, streamline look, as you decorate our Houston Blinds for Less Design Consultants will help you bring your dream to life. 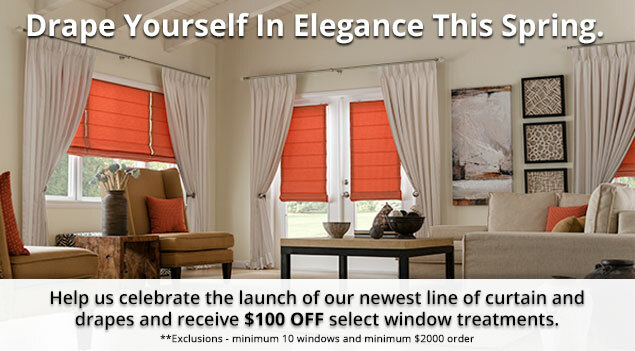 Contact us now to inquire about the collection of window drapes Houston Blinds For Less offers.